Dr. Harte received his Ph.D. in Biology from Yale University in 1982 for work on the genetic control of visual system development in Drosophila. He was a postdoctoral fellow with David Hogness in the Department of Biochemistry at Stanford University, where he characterized the homeotic gene Ultrabithorax. He joined the Genetics Department at CWRU in 1986 and is now an Professor. 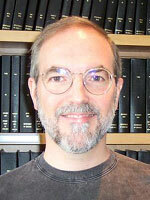 His honors include Jane Coffin Childs Postdoctoral Fellow, G. Harold and Liela Y. Mathers Young Investigator Award. He is on the Editorial Board of Mechanisms of Development. We are interested in the molecular mechanisms underlying regulation of homeotic gene expression during Drosophila development. The homeotic genes encode a family of transcription factors that act as key determinants of embryonic cell fates. Each is expressed in a different region of the embryo, programming the cells in which it is expressed to follow a specific developmental pathway. We are interested in how the spatially restricted patterns of homeotic gene expression are established and stably maintained throughout development. We are currently investigating two proteins, an activator and a repressor, required for maintenance, which most likely involves stable alterations in chromatin structure. The Trithorax protein is required to sustain normal levels of transcription of homeotic genes throughout development. It contains a novel DNA binding domain and several other novel motifs found in other proteins involved in remodeling chromatin structure. We are characterizing TRX binding sites in the homeotic genes, identifying proteins that interact with TRX, and investigating its mechanism of action in vivo and in vitro. The ESC protein is a novel highly conserved repressor required for maintaining transcriptional silencing of homeotic genes in cells outside their normal expression domains. ESC binds to chromosomes, but does not bind to DNA directly. We are investigating how ESC is recruited to its target genes, its interactions with proteins that might mediate its recruitment, including other proteins involved in silencing homeotic genes, and whether ESC promotes silencing by stably altering chromatin structure once bound. Polycomb inhibits histone acetylation by CBP by binding directly to its catalytic domain. Tie F, Banerjee R, Fu C, Stratton CA, Fang M, Harte PJ. Trithorax monomethylates histone H3K4 and interacts directly with CBP to promote H3K27 acetylation and antagonize Polycomb silencing. Histone demethylase UTX and chromatin remodeler BRM bind directly to CBP and modulate acetylation of histone H3 lysine 27. Polycomb Repressive Complex 2 and Trithorax modulate Drosophila longevity and stress resistance. CBP-mediated acetylation of histone H3 lysine 27 antagonizes Drosophila Polycomb silencing. A 1-megadalton ESC/E(Z) complex from Drosophila that contains polycomblike and RPD3. Tie F, Prasad-Sinha J, Birve A, Rasmuson-Lestander A, Harte PJ. Polycomb group proteins ESC and E(Z) are present in multiple distinct complexes that undergo dynamic changes during development. Furuyama T, Tie F, Harte PJ. A new family of cyclophilins with an RNA recognition motif that interact with members of the trx/MLL protein family in Drosophila and human cells. Anderson M, Fair K, Amero S, Nelson S, Harte PJ, Diaz MO. Interaction between the Drosophila CAF-1 and ASF1 chromatin assembly factors. Tyler JK, Collins KA, Prasad-Sinha J, Amiott E, Bulger M, Harte PJ, Kobayashi R, Kadonaga JT. Sciortino CM, Shrode LD, Fletcher BR, Harte PJ, Romero MF. Am J Physiol Cell Physiol. (2001);281(2):C449-63. The Drosophila Polycomb Group proteins ESC and E(Z) are present in a complex containing the histone-binding protein p55 and the histone deacetylase RPD3. Tie F, Furuyama T, Prasad-Sinha J, Jane E, Harte PJ. Cloning and characterization of a Na+-driven anion exchanger (NDAE1). A new bicarbonate transporter. Romero MF, Henry D, Nelson S, Harte PJ, Dillon AK, Sciortino CM. Mouse homolog of the Drosophila Pc-G gene esc exerts a dominant negative effect in Drosophila. Wang J., Tie F., Jane E.P., Schumacher A., Harte P.J., Magnuson T.
Assignment of a novel bifurcated SET domain gene, SETDB1, to human chromosome band 1q21 by in situ hybridization and radiation hybrids. Harte P.J., Wu W., Carrasquillo M., Matera A.G.